My final Bunnitch month submission for this year, as pioneered by BrickercupMasterX3, is dedicated to a phenomenal DeviantArtist, Mythiril, who was celebrating his birthday yesterday. So, I hope you enjoy this present I have for you and I wish you a blessed, awesome, and great birthday. I figured that my final Bunnitch month submission for this year would be the theme of what would Mitch, Bunny, and their kids look like ten years later. Well, this is what I came up with. It’s the year 2028 and Citysville is now a properly functioning city ranking highly alongside Townsville. The economy is thriving, politics seem to be a lot more organized and less corrupt than before, and everything, in general, is booming. Sure, there is still the occasional crime going on, but with Team Xtreme, Mitch the Persecutor, Bunny the Bouncing Mountain, and their offspring on the job to stop it dead in its tracks, both Townsville and Citysville are at peace altogether. Mitch Mitchelson, now aged 36, still has his gig as The Persecutor. When he is not fighting crime in this guise, he is a stay-at-home-dad as well as a writer. His memoir “From Trailer Park Punk to Avenging Hero” won international accolades to the point of becoming a bestseller. In terms of his duty as a father, he consistently makes sure that his children do not fall into the same trap as he did several years ago. Moreover, he ensures that his children do their homework regularly, do their chores, and even help him and Bunny with the crimefighting. He continues to keep in touch with Brick, Butch, and Boomer, as he always stated that these three were and will always be his best friends and brothers from another mother. Bunny Utonium-Mitchelson, now aged 34, continues to be the Bouncing Mountain every citizen knows and loves and criminals fear due to her transforming into her hulk form. Outside of her superhero duties, she is a Middle School English literature teacher, given the fact that she loves all types of literature and her experience with working at a bookstore during her college years. As a mother, she continues to ensure a nurturing home for her children as well as stability and discipline. She also continues to keep in touch with her beloved sisters, Blossom, Buttercup, and Bubbles, thus ensuring the familial lines of communication to be consistently open. The now twelve-year-old Ryan Kendall Mitchelson has taken some of Mitch’s mouthy nature but without being such a jerk. He consistently wears a tough side as a means to show that he is not one to be easily frightened. 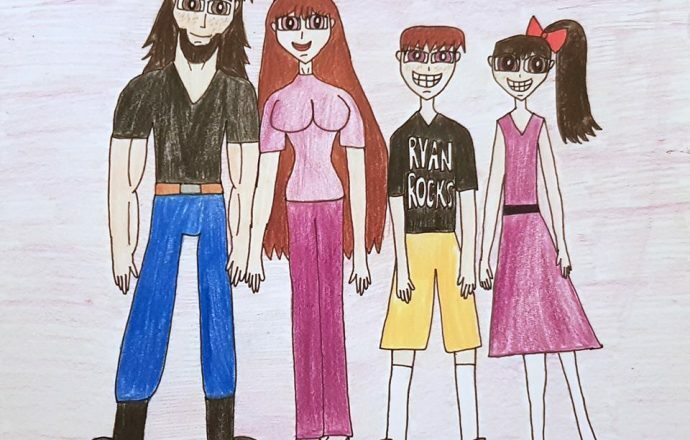 On the inside, Ryan is a kind and helpful soul not only to his family but also to everyone around him, even though he does not always like to show it in spades. As someone who is partially superhuman, he bears super speed, super strength, great reflexes, and, of course, flight. He also bears the power to transform into his Hulk form like his mother, but he still needs to learn the essence of controlling such an awesome power. Outside of his superhero activities, he is on Citysville Middle School’s soccer team and is the MVP. His favorite school subjects are PE, Biology, Spanish, and English. Moreover, he considers Brick and Butch to be his favorite uncles, as he always flies over to Team Xtreme headquarters to train with them in the art of self-defense. The now eleven-year-old Pauline Clara Mitchelson is an absolute darling on the outside. However, if one dares to push her buttons, she will be the one to beat the absolute stuffing out of that individual. She continues to make great use of those cymbal-like claps in order to stop villains dead in their tracks. Additionally, she has her supersonic scream akin to her aunt Bubbles. In terms of transforming into her Hulk form, she is more controlled. Outside of her duties as a superheroine, she is an artist in every single way. In her middle school, she is a staunch member of the Drama club, the Arts club, and the Glee club. It is said that she has a stirring, high soprano voice which is not only useful in chorus numbers but also solo performances. Pauline’s favorite subjects are Mathematics, History, Drama, Arts, Spanish, French, and English. Moreover, she considers Boomer to be her favorite uncle because of how kind and supportive he is and Blossom, Buttercup, and Bubbles to be her favorite aunts given the many stories her mother would tell Pauline about her sisters. The Mitchelson clan continues to go strong. One cannot help but be proud of Mitch and Bunny for achieving more than they can gain throughout the years and, of course, Ryan and Pauline for doing solid jobs not only as young superheroes but also as pretty good students and valuable members of society as a whole. Well, ladies and gentlemen, this marks my final Bunnitch month submission of this year. I had an absolute blast participating in this and I would love to thank my dear friend and fellow DeviantArtist, Paula aka BrickercupMasterX3, for giving me the opportunity to take part in this really special month. Truth be told, before I became a Mitch/Bunny or Bunnitch fan, I used to ship Mitch Mitchelson with Princess Morbucks because of the fact they were essentially freckle-faced, mouthy, bratty smegheads, for lack of a better word. Sure, I was only fifteen years old when I got introduced to this pairing and I thought it was kind of cute even before I thought about shipping Mitch with Bunny. However, now as an adult of twenty-six years old, I can attest that Mitch/Princess is a toxic pairing which will not last for a long time. This was also why I had to put that little “subplot” of Mitch formerly dating Princess during their tween and teen years in my first Bunnitch entry because now I acknowledge how fatal and emotionally draining their sham of a relationship would end up being if Mitch and Princess ended up going long term. There would be no happiness, no healthy synergy, and no clean structure. With Mitch and Princess it would just be shouting day in and day out, manipulating each other to do their bidding, and neither of them will win nor experience true fulfillment, it would just be empty promise piled up on an empty promise, which is destructive. In hindsight, it is entertaining and hilarious to see Mitch and Princess bounce back and forth off of each other in fanworks. However, now that I think about it their relationship would have played off like the Vicomte de Valmont and Marquise Isabelle de Merteuil from Pierre Choderlos de Laclos’s “Dangerous Liaisons” and Sebastian Valmont and Kathryn Merteuil from its modern teen adaptation “Cruel Intentions”, in which two unpleasant are out to destroy each other. When the thought of Bunny being a more substantial partner to Mitch came to my mind based on all the fan art, I thought to myself, “Heck, yes! That’s where it’s at!” I envision Bunny to be a kinder, more emphatic, more sensitive, and more wholesome soul, in spite of being a misunderstood person because of her great power of turning into her Hulk figure. This is where my love for Bunnitch came to be, as Bunny can be the very person in Mitch’s life who can give him unconditional love that money cannot buy. Moreover, she would be the very person to be Mitch’s moral compass in deciphering right from wrong, thus ensuring a more stable relationship. Plus, combining Bunny’s superpowers with Mitch’s combat skills is something to be reckoned with. All in all, I really enjoyed Bunnitch month, as this pairing really grew on me so much. 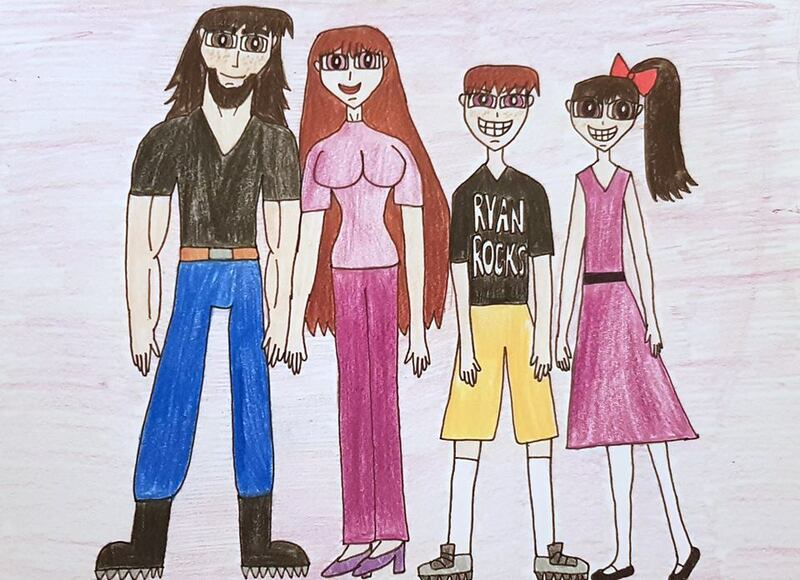 I hope you all enjoyed this post as well as this piece of fan art. See you on the flipside and take care. Ryan Kendall Mitchelson and Pauline Clara Mitchelson belong to me.